The unfathomable mystery of the divine Trinity has been compressed into a small sculpture, not even 30 cm. high. 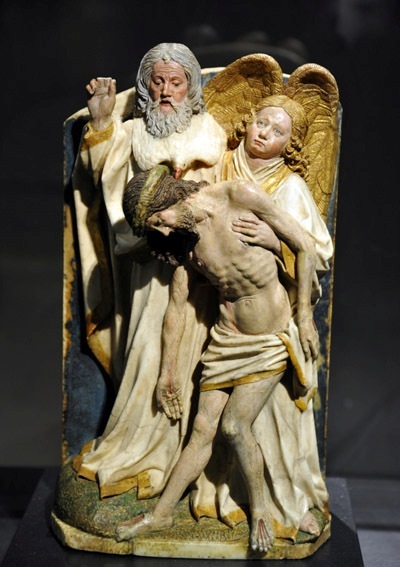 Around 1430 it was made out of a block of alabaster by the South-German sculptor Hans Multscher (ca. 1400 – 1467). The intense confrontation of the Father with the dead body of his Son is shown in an extremely serene and reverent way. The Dutch art historian Henk van Os included this sculpture in the exhibition ‘Gebed in schoonheid’ (Prayer Embedded in Beauty) that he put together before he stepped down as director of the Rijksmuseum in Amsterdam in 1994. In the catalogue he writes about the ‘moving relationship between the Father and the Son’ and about the ‘great plastic presence’ Multscher gave to the lifeless body of Christ. The sculpture is not only embedded in beauty but also in piety. Users of this object of devotion have scratched their prayers on the foot and backside of the sculpture. We see God’s Holy Spirit surface as a huge dove from beneath the beard of the Father and skim over the hair of Christ crowned with thorns, comparable to the way he descended on Christ at his baptism by John in the river Jordan. This is the moment when a voice from heaven said: ‘This is my beloved Son.’ In Christian tradition this is seen as the revelation of the mystery of the Trinity. Nevertheless the idea of the Trinity has always been subject to theological dispute and its artistic representation has been an impossible task for artists. For some of us this small sculpture may well trigger questions rather than prayers. The Father looks apprehensively at his Son. Is he recoiling? He raises his right hand (of which two fingers have broken off). Why? In order to bless or because he is frightened? Is he warning us? A strange tension is present in this sculpture. The weight of Jesus’ body is being lifted by an angel, it rests on his knees as on a misericorde, but at the same time Jesus stands on his own legs. The angel shows the dead Son to the Father who is looking down on him as well as to us. The angel himself is glancing up to heaven. In a sad way? Questioning? When we think we can guess the emotions and thoughts of the angel, these are perhaps our own thoughts and emotions. What do we think and feel when we follow the gaze and interaction of the Father, Son, angel and descending dove? Before his retirement Jan van Lier worked at the Higher Catechetical Institute in Nijmegen, The Netherlands. He researches the meaning of visual art for the tradition of the church and religious life. He takes part in publications and lectures in this field. God the Father on his throne shows the dead Jesus to us while holding him in his arms. See e.g. Albrecht Dürer: The Adoration of the Holy Trinity, 1511, Kunsthistorisches Museum, Vienna. The Father has the dead body of Jesus on his lap. See Robert Campin: Holy Trinity, 1410, Städelsches Kunstinstitut, Frankfurt. The sculpture by Multscher is a variation of the second type.